Kingsurf is one of the most renowned and popular DotA teams in the world. Here's a little feature from ChinaPress about Malaysia's KingSurf. Which child in this generation does not play video games? About her son Lee "xiaogui" Wen Chek's choice, she supports him with tolerance while supervising her son. "I did not stop him from playing video games, because he had this talent, being his parents, I could not hide his talent for video games," said Cheng. While supporting her son in E-sports, she also "escorts" his son, analysing her son's future. "Children should have their own choice once they are grown up. The important thing is he must have clear understanding of the path he is on, and treat it seriously, learn to be responsible for what they have done." She smiled and said "My son is sensible, he tells me immediately everytime he won an award, I feel glad for him that he dealt with E-sports seriously." "I never expect him to be so good at video games, he can even finance his own living cost! But of course I still hope that he can continue his studies." With the superstar Yamateh in the team, xiaogui's performance always remained hidden, but it is good enough. There's no doubt that he is one of the best supporters in the DotA scene. There is a comment by a DotA player about xiaogui, commenting his ability. Xiaogui, who is only 19 years old, is the leader and strategist of Kingsurf. He might look like a kid, but he is definately one of the top players around. Starting by getting stuck into the game, then forming his own team for tournaments, he does not want to lose. Therefore he treats every tournament seriously. "I think the secret to success in DotA is teamwork! DotA is a team game, it is impossible to win one againts five no matter how strong you are, right? Support between teammates enables unlimited strategy posibilities, this is why DotA is so attractive." Lee Wen Chek pointed out that teamwork determines the performance of a team. "Besides having knowledge of heroes and skills, other issues like synergies between heroes, good understanding of the terrain, are the "ammunition" of the team. In some cases, this knowledge became the key to the victory. Perhaps everyone thinks that the indulgence of the game will affect his life, but he thinks it is all about time management. If one can manage time well, managing both gaming and studies would not be a big problem. "I would like to thank my parents for their tolerance and encouragement, so I can try living the way I want - as a pro-gamer, but not going too far." Wong "eryc" Wei Zhen: E-sport will be globalized. In our country, everyone sees video games as video games. Even some of the players themselves might not understand the true nature of gaming. But in fact, video games have already evolved into E-Sports. Being a DotA player himself, Kingsurf's manager eryc feels that E-sports are not only sports, it affects the software industry, online games, broadband telecommunications operators, owners of internet cafes, hardware manufacturers, and even the PC industry. "However, it is very dificult for Malaysia E-sports to become a thriving industry because of the lack of regulation, investment, professional, social environment, and so on, all parties need time to adapt and gradually start changing." "I still think that E-sports have a great potential. It wil eventually be globalized, recognized by everyone in the world. It is not a dream, but a trend..."
"I am confident that this day will come, like how Kingsurf made its own way to the world arena.." In Asian countries, many youngsters love E-sports, but their parents are bound to traditional concepts, thus stopping their children from involving themselves in E-sports, therefore, E-sports receive both support and defiance from the community at the same time. The key to the development of E-sports is that players must be taught how to find a balance between gaming and life. "I hope the performance of our team can be a role model to parents and public." 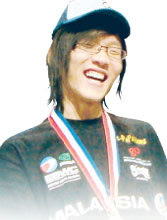 Lee Wei Xiang who has 3 years experience in DotA and is now a professional gamer. He lives on tournament prizes and team allowance. Having great talent for video games, he has the support from his parents. Papaxiong is now one of the best support players in the international DotA scene. "The training needed for a pro-gamer to keep up his standard such as 10 hours of online training everyday, is not as easy as it looks like." He also added that Malaysia's poor broadband network caused problems in online tournaments and training. Imagine how Kingsurf plays in online tournaments, first spending 3 hours looking for a host, and delay in the game after that. When the game is finally started, it is already 4am. Still, some of them need to attend classes or work the next morning. This is the main problem that Ks faces in online tournaments. "The main problem is finding a suitable host." Technical differences, as well as network infrastructure deficiency is an unavoidable dilemma in Asian countries. However, the poor network between North America and Europe is also one of the main reasons. "We face the same problems with other Asian teams. Because of the delay, we often make mistakes in online training and tournaments, so we must learn how to overcome the delay." Although he always plays in such poor conditions, it never stops his enthusiasm for DotA. Excellent post. I enjoyed by reading. I came to know lot of information.I will recommand your site to others. Thanks for sharing.